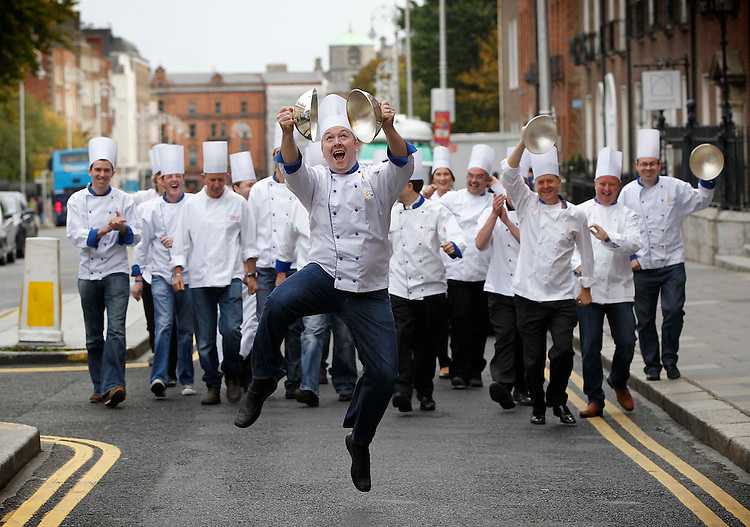 No Repro Fee....Pictured here launching into the Euro-toques Young Chef of the Year Competition is Gearoid Lynch, Chef/Proprietor of the Olde Post Inn, Co.Cavan and Commissioner-General of Euro-toques. Ireland's most prestigious culinary competition, Euro-toques Young Chef of the Year, is celebrating 21 years of culinary talent in Ireland. Gearoid is pictured alongside 20 professional chefs celebrating 21 years of culinary excellence..Sponsored by BIM and Failte Ireland this year, The Euro-toques Young Chef of the Year is open to professional chefs & cooks across the island of Ireland, under 25 years of age, and is the only professional culinary competition in the country based around local and artisan food ingredients. Through mentoring and training based prizes the competition aims to contribute to the professional development of promising young industry professionals..Euro-toques chefs and cooks are committed to a philosophy of quality food sourcing, with an emphasis on seasonal, local and artisan ingredients. They aim to keep the art of real cooking and culinary traditions alive; promoting respect for classical skills combined with modern industry techniques amongst chefs. The 2011 Euro-toques Young Chef of the Year is a wonderful chance for budding young professionals to gain valuable skills and experience, with the prize package centering on mentoring and career development opportunities..The top prize for the 2011 Young Chef of the Year will be the opportunity of an all-expenses paid stage at the famous Ivy Restaurant in London under Executive Chef Gary Lee. Plus a one week stage at the award winning Michelin star Chapter One restaurant in Dublin under the tutelage of Euro-toques head chef Ross Lewis..Pic: Robbie Reynolds/CPR.